HE has moved from selling sweets on the streets of Kabwe to rubbing shoulders with one of, if not the most powerful man in the world, Barack Obama, the President of the United States (US)! On the local scene, he has done likewise, he has rubbed showders with the most powerful man in the country, President Edgar Lungu and First Lady Esther. In his own words, Brian Bwembya, popularly known as B Flow, is currently ‘dining with Kings and Queens’. Having met and interacted with presidents, among other influential individuals locally and internationally, one would think that B Flow has now ‘grown wings’ or become ‘big-headed’ (pompous) and completely forgotten about his impoverished past, like others have done. Well, it seems the heightened fame B Flow is enjoying has not changed him in any way as he is still down-to-earth and is not ashamed to talk about his life before becoming a star. “When I came back to Zambia from the US, I saw a lot of my fellow young people wanting to find faults in me, trying to think that obviously I am big-headed now that I met Obama, but then I said, “I am the same old person, you don’t need to look at me that way”. “So you find that they are judging you and they are looking at you in a way that they are just imagining you are this new person when you are totally the same person you were even before you went to the US,” B Flow said. B Flow rightly observes that when God blesses someone, not everyone will be happy for that individual. He further notes that when God blesses someone, He erases all the pain and B Flow admits that his past is a sad one, but that the present situation is too amazing that he cannot complain about the pain he endured before. His past inspires him. B Flow’s life is now like an open book as he takes to social media to share his past life struggles and the present blessings as an artiste and Goodwill Ambassador, attracting numerous likes and comments from his horde of fans and critics. B Flow is a double orphan following the death of his parents, with his father being the first to die when he was aged nine. He lost his mother in 2014, the same year his close friend, crooner Brian Cheengwa, alias P Jay, died. Besides selling sweets in 2001 to help lessen the burden his unemployed mother was carrying, B Flow could not afford to buy a new pair of shoes to wear at school in Grade Four, resulting in him wearing his sister’s. Not only was he a laughing stock at school for wearing his sister’s shoes, he experienced similar teasing while wearing his torn shoes. In Grade Seven, B Flow did not have a school uniform, prompting him to cut a piece from his sister’s dress and made shorts out of it as he could not afford to buy a new uniform. 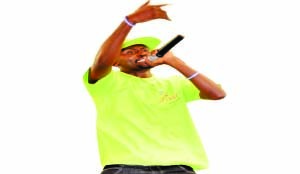 B Flow moved to Lusaka in 2005 to chase his dreams. He, however, did not have it smooth as music studios turned him down from that year to 2008. He was once chased by people he was staying with in Lusaka in 2006 after they accused him of stealing a cellular phone, but luckily enough a ‘good Samaritan’ took him in and offered him the kitchen floor, which he used as his bedroom until 2008! Well, as the clichés says, the rest is history as B Flow is now a superstar, but what saddens him is that his mother is not here to see what has become of her son and he has put his thoughts in a song called Dear Mama in which he features President Obama!